Here’s a fact: we’re a society that wants to be entertained. We binge watch, scroll and get our news in headline form. We are over-scheduled, constantly busy and stress out. And I’m as guilty as everyone. Tell your story so people start talking about you. I’ve already mentioned a million times that our attention spans are shorter than a goldfish. Well, it seems as if it is getting shorter every day. And all the means is what worked last year to grab attention and earn new customers just isn’t working anymore. Telling stories is a great way to do that, but even that on its own isn’t enough. You have to make them shorter, entertaining, authentic, and unique. You earn the right to sell by serving and connecting with your ideal customers. I’m going to go out on a limb and guess you aren’t finding much argument with what I’ve written so far. But that doesn’t really answer the question of “What to do,” does it? Stick with the status quo and you lose. Plain and simple. There are many different ways to adapt to the rapid changes in social media. Some are free and time-consuming and some will cost you, yet save you time. But if you want to use social media to grow your business, you need to be prepared to pay something. Compared to traditional advertising of days gone by, social media is still a deal. We’ve just have to get used to the new normal. I know you know that there is no magic pill and no single strategy will work for everyone. That’s why adapting and experimenting is so important. Whether you’re monitoring your audience’s hashtags, trying out different social platforms, experimenting with posting schedules or testing new features, there is simply too much activity in your feeds to get noticed without paying. Visuals are a must and they have to be scroll-stopping worthy. And the first words you audience reads better be entertaining and interesting. Use humor. Life is too serious and if you can lighten it for someone every now and then, consider it a win. Be human. People want to gather around other people like them. Share the bad, along with the good and the ugly, along with the pretty. Be opinionated. Remember, you don’t care about catching the attention of someone who isn’t likely to do business with you – so don’t worry about pleasing everyone. Tap into what’s happening now. Look for local and national events that interest your ideal customer. Join the conversation, share relevant content, and be present. It can be time-consuming, but planning a few real-time campaigns can go a long way. It’s better to stand out on a few platforms than to be spread too thin and put out uninteresting content that isn’t getting you noticed. I suggest starting by focusing on mastering one platform why dabbling in one or two others. Trying to master more than one at a time can be time-consuming and distracting. But it’s easier to master a platform with a bit of presence when you start the process. Which means don’t ignore the other platforms your customers are hanging out on just to master one. It goes without saying, that you should choose platforms where your ideal customers are active. Note: Just because a social media platform is the right one today, doesn’t mean it will be the right one tomorrow. A good indicator that you are on the right social media platform comes from monitoring what your competitors are doing, what your audience is saying and how your engagement is progressing. Anecdotes are a great way to let people into your world and get to know you. Pair anecdotes with stunning visuals with notable events from the calendar and you have content that is going a step above and positioned to grab attention. Story scenes are the building block of your stories – the stories designed to help move the customer through the journey towards making a buying decision. The reason why story scenes are perfect for social media is they depend on starting with action and getting straight to the point. Sometimes they are short and sweet and sometimes they are a bit longer and they are a perfect way to experiment with different types and lengths of content. Now you might be wondering if we have such a short attention span, why experiment with long content? Because if the story is good enough, people will pay attention. And you want people paying attention to your content as long as possible. Inside of Powered by Story, I walk you through the creation of 13 story scenes designed to turn browsers to buyers. And to help you get started, I’ve taken three of those story scenes that are perfect to help elevate your storytelling on social media. This workbook is rapid-fire story crafting at its best. Enjoy! I read. A lot. And as a result, I pick up quotes and tidbits that I use in my business, in life and even with my teenagers. As someone who helps small business owners tell better stories, I have to spend some time getting their buy-in that telling a better brand story will actually help their business. There is an automatic wall that goes up because they don’t think they can do it, they don’t think they’ll be good at it, and it isn’t something that will necessarily give them a quick win. My job is to help them overcome their inner critic and to begin to see themselves as a storyteller. Storytelling is a long-term marketing strategy for sure, but there are quick wins to be had, everyone can do it, and everyone has the potential to be good at it. Like most things, storytelling is a skill. So, when I set out to convince small business owners that a better brand story has the power to transform their business. I use the following quotes to help me convince small business owners that a better brand story has the power to transform their business. David Nihill, Do you Talk Funny? Scroll down for a replay of the live workshop, links and the transcript. [00:16:49] Share in appropriate groups where the group rules allow you to share. We all get added to a ton of groups right? And you’re probably in groups of all sorts – whether it’s industry related groups, shopping groups, you name it. It only makes sense to share things of value to people who will benefit from the information. [00:18:57] Idea #7: Strip the audio out and turn it into a podcast. [00:20:29] Idea #8: Create an Infographic of your key points. [00:23:26] Idea #9: Create a Pinterest How-To Graphic. How to Breathe New Life into Your Facebook Live Videos. I WANT A LIST OF POPULAR FACEBOOK LIVE IDEAS! Scroll down for a replay of the live workshop, links and a transcript. Create Strategic Video with the Buying Journey in Mind. Video is here to stay, my friend. Or at least it’s here until the next big thing. By the end of 2017, online video will account for 74% of all online traffic. And using the word ‘video’ in an email subject line boosts the open rates by 19%. It’s time to plan how to share your brand stories on video and live streams. And I can help. Stay tuned to your inbox for more tips on how to tell a better brand story. Click here to get your free guide: 30 Popular Facebook Live Ideas to Help Get You Started Live Streaming. You might think you can just go out and tell your story. I mean it is your story, after all. But the reality is to use your business story to grow your business; you have to create stories that your ideal customer will respond to. Want to know more? Well, let’s go into each of the four steps in more detail. But before we do, I wanted to help you get a start creating your story vault so I created The Business Short Story Workbook. Click the button below to get it. The best way to take your business to the next level and tell a better story along the way is to make sure you are operating from a place of knowledge. Knowledge about your business, your ideal customer, and especially, about your competitors and your industry. There is a whole host of information to be discovered when you do some investigative work. For most small businesses, this investigation happens in the beginning stages of building their business, but like most things, gathering information isn’t a one and done kind of thing. If you don’t know what your competitors are up to or what today’s challenges are for your ideal customer, the stories you’re telling won’t resonate, evoke emotion or inspire action. One of the best pieces of information you can gather is learning how your customers are finding solutions to their problems. If you know how they are searching, then you’ll know how to answer their questions. And one of my favorite tools for this is keywordspy.com. It’s a free tool that helps you uncover high-value keywords to help you plan your content and your stories better. Now, there are paid options to this service, but the free tool is just fine. As a bonus when joining Brand Story School, I take you through a detailed plan of action to thoroughly research your competitors, your customers, and your business to be better prepared to fill out your Brand Story Canvas. Here’s a blog post that goes into the Brand Story Canvas in detail, The 6-Step Blueprint for Telling a Brand Story That Sells More Stuff. 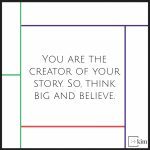 But for now, you should know that when you begin building your story foundation, everything stems from the Brand Story Canvas. There are a lot of things that go into crafting a great story. And to help small business owners tell better brand stories, I’ve simplified the process into six core elements: The Hero (your customer), Their Pains, The Mentor (you), The Results (both successes and failures), The Plan, and The Call to Adventure. When first setting out to teach business story sharing about five years ago, I found that most Small Business Owners were overwhelmed at the idea of transitioning what they know about their business into a story. You see, it’s much easier to spout a list of memorized facts than to open up and try to form an emotional connection. But it’s that emotional connection that inspires potential customers to buy. In fact, The Advertising Research Foundation proved that “likeability” is the trait most likely to increase sales. And research also shows that when you use emotional triggers in an ad, a potential customer is 2-to-1 more likely to buy a product. That’s why I’m on a mission to bring better brand story sharing to local businesses. Local small businesses and their owners have the stories to share; they just need a little guidance. Does that sound like you? Then the Brand Story Canvas can help. And as I mentioned earlier, I break it all down here. I also give you a heads start on your story vault with The Business Short Story Workbook. You can get that by clicking the button below. The next key component of a solid story foundation is your personal Story Vault. Inside Brand Story School we work through a whole host of business stories (ten, in fact) and story scenes to help you sell more stuff. That’s because not all stories are created equal, and neither are your audiences. Whether you are talking to a large group, an intimate gathering or telling your story to an audience of one, being prepared with the right story at the right time is crucial. The answer to this question is what I refer to as The Business Short Story. While simple in theory, it can be hard to master. And because of that, most business owners end up stumbling through a basic introduction of who they are and what they do. I think we often overlook the importance of the quick introduction. Have you ever been asked about your business, and you verbally vomit a bunch of nonsense? I know I have, and if you’re honest, I guess you have too. Sure, the classic elevator pitch is on everyone’s radar, but it’s only used in the traditional sense. Enter, the business short story. A collection of stories you can use, so the quick introduction becomes memorable. The reality of doing business is you should always be pitching your business. Always. You never know who is on the other side of the handshake, email or phone call. Treat every contact as a potential customer, investor, or loyal fan, because in one way or another they probably are. As a start to your very own story vault, I created the Business Short Story Workbook to help you create better and more memorable introductions. Just click the button below to grab it. And the final piece to your story foundation is the tips and strategies you need to be a better story sharer. Notice I use the word story sharer over storyteller, and that’s because we know through countless studies that sharing vs. telling is a much better approach to influence someone. Research shows our brains are not hard-wired to understand logic or retain facts for very long. For over 40,000 years, we’ve been communicating through stories because our brains are wired to understand and retain stories. And recently, Stanford University conducted a study that tested fact-telling against story sharing. Students listened to two different presentations: one more traditional including facts and figures. The other was based on a story. Five percent of the students were able to cite a statistic from the presentation, but 63% were able to remember the story. One of the most important tips I can give you today is to make sure you are in love with the right stuff. Yes. I want you to fall in love. I know. I know. But I want you to hear me out because this is where most small business owners make a huge mistake. You see, they fall in love with their mistress, instead of their wife. In business speak that means they fall in love with their product, service and their business instead of their customer. And the first thing you need to do before you can tell a better story is fall in love with your customer – they are the hero of your story after all. 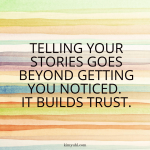 Bottom line, if you want people to remember you and your business- share a story. Remember, your community and your business become stronger with every story you share. Overthinking Can Kill You. Seriously. You may think I am a bit overdramatic, but I’m not. A study from UC Santa Barbara suggests that thinking too much about something leads to poor judgement and decision-making. And poor judgement and decisions, can be harmful and even lethal in some situations. Here’s a personal example. When I was about ten-years-old, I was trying to teach my brother how to skateboard. Normally, skateboarding is just something you do, right? You don’t have to think too much about it just do it. But while I was teaching my brother about it, I was thinking about all the things you had to do to get power, to turn, to stop, etc. I was concentrating so hard on the steps that I ran into a tree and sprained my ankle. So, it’s true I didn’t die but you can see where thinking too much can be harmful to your health. Overthinking, especially when our moods affect our thoughts, impacts our normal functions. That’s bad, in case you’re wondering. It’s why our inner dialogue is so important to our thought process. Think about it (pun intended). Thinking things like “I’m not good enough” or “nothing ever goes my way” is painful, and it keeps us thinking about the bad stuff instead of just doing what we need to do. Any thought pattern that is based on extremes can signify trouble. If not succeeding translates into failure, then it is time to question your thoughts and reframe them into finding the lesson. Assuming the worst without the facts, is a classic example of being in a negative thought pattern. 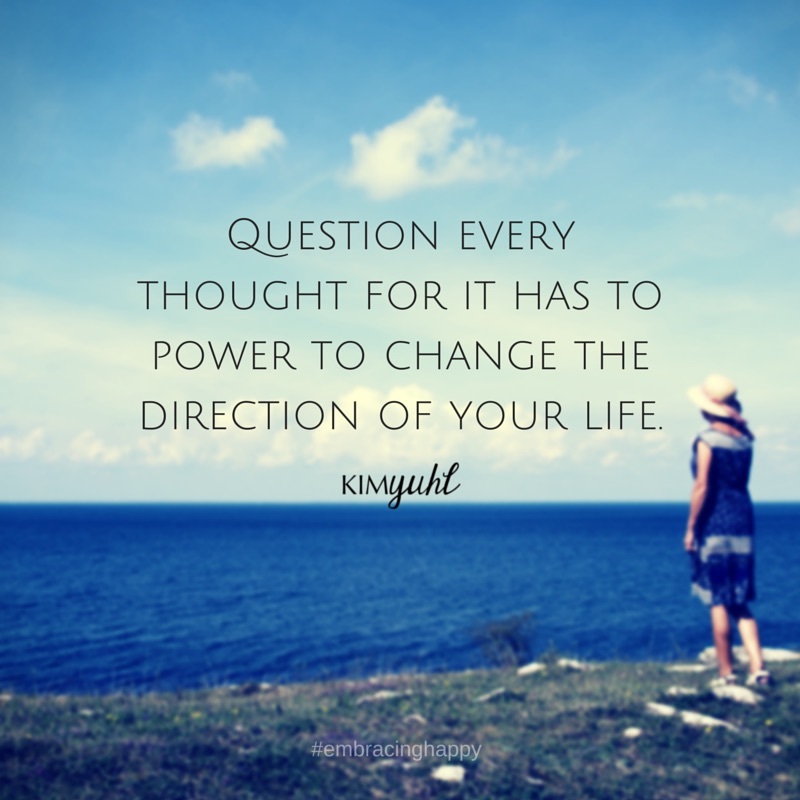 Questioning your thoughts can help interrupt these patterns. In most cases, your worries and fears are unfounded, and you end up worrying for nothing. Feelings are treated as facts in your mind, rather than perceptions that change over time. For example, feelings of guilt mean you’re a terrible person and being afraid of something means you’re in real danger. That is why it is important to understand and work through your feelings. You feel disappointed, guilty, frustrated or angry when things don’t go the way you had hoped or expected. Self-talk commonly includes words such as should, must, have to and ought to. In addition to having unrealistic expectations for yourself, you demand a lot from others and get upset when they fall short. I should have done … will get you nowhere. Tackle “should” statements by working on the things you can change and accepting the rest. You blame yourself for results that are out of your control. You make the failure lack of results about you instead of about the action that caused the results. Focus on actions and behaviors and what you can change instead of focusing on yourself or any person for that matter. I often talk about the importance of asking questions when we start to engage in this kind of unhealthy thinking. It’s really important to question them, figure out what it’s trying to tell us and move out of that thinking and back to the task at hand. The Conscious Pause and Mindful Breathing are two exercises that helps us to be more mindful of our thoughts and more importantly our responses to what is happening at the moment. You can get them here. As I sat down to write this lesson, I spent a few minutes looking around my desk and office and focused in on some details. I realized I have some space on my vision board, that my bookshelves need some dusting, that my computer screen could be cleaner, the pine trees are beautiful outside my window, I really love that picture of my husband, and my desk is actually clean at the moment. Now I want you to do the same thing I did just a few minutes ago. Take a second. Look around your environment. Look at the texture of your roof, look at the color of your computer cords, look at the light on your computer. Notice the details. Go ahead, take a look. What’s around you? Congratulations, you just brought yourself back into your current reality. Now, you might argue that you were already here, and you are right – at least physically. But what about mentally? And if mentally, your mind is wandering in a million directions, like mine often does, and it isn’t really present, then can you consider yourself present in your reality? When we bring our mind back into the present, it will help to disarm the power of negative and unhealthy thoughts and overthinking in general. When you start to recognize overthinking and unhealthy thought patterns, take the time to breathe and bring yourself back to now. Unhealthy thinking is part of life. It’s how we handle and move through that thinking that matters and affects our overall happiness. Take the time to recognize the signs as they appear and then breath and pause your way to better thoughts. Take a look at this video [1:24] of Jon Kabat-Zinn and Oprah as they talk about how mindfulness can restore balance to your life. Pretty good stuff, right? Download the free exercises to help get you on the right track with your thoughts and prevent overthinking things from killing you. A little warning, this is long but it has a ton of valuable information. I found in reading over 70 books on the subject that there were several themes that all point back to living our best life. And how do we do that? By expressing the best version of ourselves in every moment. Now I get that is a very vague instruction on how to be happy. And as I began to dig deeper, I found that the best version of ourselves is expressed through certain attitudes – twelve of them in fact. I like to call these the twelve attitudes of happiness and you can learn more about them and a specific action in a free download by clicking below. Here’s the thing. When who we are and who we are capable of being match magic happens. It’s then that we experience joy, enthusiasm, confidence and yes, even happiness. Unfortunately, for many of us what we are capable of being and what we are actually being don’t match. And there’s a gap. That’s when regret, worry, and anxiety happens. The bigger the gap, the bigger the feelings of longing for something more. So what’s the key to happiness? The key to happiness is closing the gap. Well, honestly all you are doing in moving yourself back to center. You might be decreasing the amount of negativity but are you increasing the positivity? For instance, you might see articles like 10 Ways to End Overwhelm, or The 5 Steps to Stop Negative Thoughts and these are great to stop something but then what? To be happier, to build on the attitudes, you need to go from negative to neutral and then move the needle into the positive. In order to move the needle, we have to focus on doing our best stuff. We need to make excellence a standard. But how do we do that? Is it motivation? Is it desire? Is there an incentive? Sure all of those things matter but what we really need is willpower. There is a lot of science that supports the importance of willpower in getting what we want. In fact, there is a study that says willpower outperforms IQ in predicting academic performance 2:1. That means it doesn’t matter how smart you are if you have willpower you have the ability to outperform those that don’t – no matter how smart they are. The good news is you can cultivate willpower and it’s that willpower that builds on your 12 happiness attitudes that will then close the gap between what you are capable of being and what you are actually being. Willpower is what you need to close the gap. So if closing the gap is the key to happiness, willpower’s the lock waiting for the key to open the door to your best life. Really, anytime you are getting ready to create change, you can either get motivated (increase your desire to take action) or use willpower (force yourself to take action). Now when you look at that statement, it seems as if motivation is the obvious choice but is it? By now, you should know it’s not. Any kind of change requires repetition and consistency to make the change permanent, and when your action is dependent on summoning up the motivation through self-talk, rewards or the gentle nudging of a friend, you will eventually blow them off. Motivation is not reliable because it’s based on how you feel, and we’ve known for centuries that human feelings are not predictable and are easily influenced by outside factors. Now, while I am all about feelings, when you know you want to make the change, feelings should be left out of it. Because the change process is hard. And we don’t like hard. Knowing that – the clear choice becomes willpower but there’s a reason you don’t hear a lot about it. Willpower is less comfortable and politically incorrect. You are forcing yourself to do something after all. – it’s forcing you to do things – things that might not make you feel good in that moment but will make you feel great when it’s all said and done. Another reason willpower gets a bad rap is that people tend to bite off more than they can chew. Goals that are too big, drain willpower. Even if the big goal is spread out over time, the brain gets overwhelmed because it recognizes the goal in its whole, not the steps you will take or the time you have allowed yourself to get there. Keep in mind that your brain resists change. It’s designed to resist change. Lasting change only happens after a lot of repetition. And it’s our willpower that helps you do whatever it is over and over again.The thing is when you use your willpower to force the action, the results that come from that action often will motivate you to keep going. We may all have been born with the capacity for willpower, but some of us use it more than others. People who have better control of their attention, emotions, and actions are better off almost any way you look at it. They are happier and healthier. Their relationships are more satisfying and last longer. They make more money and go further in their careers. They are better able to manage stress, deal with conflict, and overcome adversity. They even live longer. When pit against other virtues, willpower comes out on top. Self-control is a better predictor of academic success than intelligence (take that, SATs), a stronger determinant of effective leadership than charisma (sorry, Tony Robbins), and more important for marital bliss than empathy (yes, the secret to lasting marriage may be learning how to keep your mouth shut). If we want to improve our lives, willpower is not a bad place to start. Bottom line: Willpower is huge. It is also our ability to exhibit self-control. She goes on to say willpower is a response that comes from both the brain and the body. The willpower response is a reaction to an internal conflict. You want to do one thing, such as smoke a cigarette or supersize your lunch, but know you shouldn’t. Or you know you should do something, like file your taxes or go to the gym, but you’d rather do nothing. There is plenty more good stuff in her book if willpower is a topic of interest, and it should be if I can be so blunt, then check out her book. For now, it’s important that you know, you use your willpower every time you say no to something you want, every time you hold your tongue in an argument and every time you stay off Facebook during work. The good news is willpower is like a muscle. When you use it too much it gets tired and can slow you down. And just like the muscles in your body, you can strengthen it so it will work more effectively for longer periods of time. Being under high levels of stress means that our body’s energy is used up in acting instinctively and making decisions based on short-term outcomes. Our willpower will lose the battle for energy when we are in stressful situations. Mindful breathing can be a huge help to lessen our stress and in situations when we feel overwhelmed. Taking a few minutes to slow down and breath can help reduce anxiety and calm our frantic brains which will improve willpower. Here is a link to an article with some helpful mindful breathing exercises that will help slow everything down and not only reserve your willpower but build on it too. 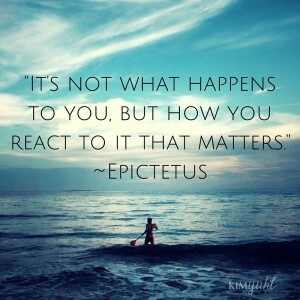 When things go wrong our initial reaction is to make some sort of change to make it better. Making spur of the moment change causes stress, forces us to make decisions that are not well thought out and has us questioning everything around us while reacting to less than ideal situations. This kind of pressure wrecks havoc on our willpower. 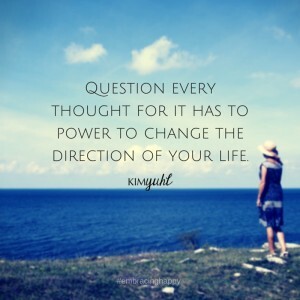 Taking action and making decisions is a part of life. But sometimes, it is better to let the decision-making wait. The pressure to not only make a decision but make the right decision weighs on our ability to think clearly. Postponing something can be effective in making rational decisions. In his book Willpower: Rediscovering the Greatest Human Strength , Roy F. Baumeister explains that people who tell themselves “not now, but later,” are generally less tormented by the thing they are trying to avoid. It might be because you don’t have all the information, you aren’t looking forward to something you know will be unpleasant or you are unsure if you are on the right path. All that uncertainty wrecks havoc on our willpower and can end up affecting what you are trying to accomplish. Let the decision happen when it feels right and don’t rush it. You might know about my love affair with sleep. Once I found it and honored, it really did change my view on the world. But I’m not the only one that thinks so, Kelly McGonigal also says getting enough sleep makes a big difference to the strength of our willpower. Sleep deprivation (even just getting less than six hours a night) is a kind of chronic stress that impairs how the body and brain use energy. And you can’t have willpower without energy. And if you’re wondering how much sleep is enough, here’s a rough guide: one of the most acclaimed sleep researchers, Daniel Kripke, found in a recent study that “people who sleep between 6.5 hours and 7.5 hours a night, live the longest, are happier and most productive”. Exercise and good food can boost willpower. Both relaxing, mindful exercise like yoga and intense physical training can provide these benefits though McGonigal points out that we’re not sure why this works yet. What you feed your body affects how much energy you have and you can’t make a change and tap into your willpower to get things done without it. It can be as simple as more plant-based food, less processed food, and half your weight in water. Not only will exercise and good nutrition improve your willpower, but they’ll make you feel better as well. Exercise, in particular, is known for making us happy by releasing endorphins: These endorphins tend to minimize the discomfort of exercise, block the feeling of pain and are even associated with a feeling of euphoria. Meditation has also been linked to increasing the reserve of willpower we have available, as well as improving attention, focus, stress management and self-awareness. McGonigal suggests it begins to work immediately. And it doesn’t take a lifetime of practice — brain changes have been observed after eight weeks of brief daily meditation training of as little as 5 minutes. People with low willpower,use it to get themselves out of crises. People with high willpower use it not to get themselves into crises. You can’t make a change, take an action and you certainly can’t close the gap without it. To start strengthing your willpower do one thing today. Start with one of the twelve actions that support the 12 happiness attitudes you can find in your free download. As you start whatever action you choose, use the tips I mentioned here to help keep your willpower working for you as you make the change. And remember to pay attention to how you feel along the way. THIS IS FUNNY – WATCH IT! Now it’s time to bring a little humor into this discussion So I have included a video down below that gives a wonderful visual to willpower. There’s a famous experiment that tests kid’s willpower using marshmallows. This is a really funny video of what it can look like. I am sure you can relate to some of their expressions. Pretty cute, right? I know you can relate to the faces of torment that sometimes accompany willpower. I sure do. Honestly, some of those kids have way better willpower than I do. Here’s the deal … Everything we do as women(sorry, men) begins with managing our inner critic. Make no mistake about it, this is primarily a women’s issue. In fact according to the Harvard Business Review, men will apply for a job when they meet only 60% of the qualifications, but women apply only when they meet 100% of them. And according to the research, the number one reason women don’t apply until they meet 100% of the qualifications is “they didn’t believe they would be hired and didn’t want to waste their time and energy.” Funny enough it had very little to do with their belief in their ability to do the job well. What does this statistic say? It says that we, as women, are the ones holding us back. Not the glass ceiling, not the old-boys network, and certainly not our lack of skill, talent or intellect. It’s us and our inner critic. I found a new respect for my inner critic from the book, Playing Big by Tara Mohr. If you want to do some work on yours, you really should check out the book. 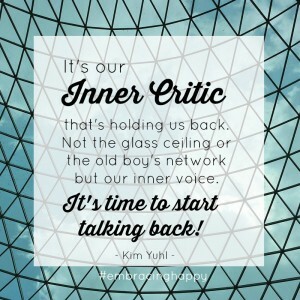 What Is Our Inner Critic? Well it’s that voice in our head that doubts are abilities. It’s self-doubt realized through the inner chatter in our head. It is so common and has been around for so long that we don’t even recognize it. It’s a Black and White Thinker. You are fat or skinny. You are smart or dumb. You are gorgeous or ugly. There is no room for grey – either you are or you aren’t. It Pretends to Have Your Back. It appears to have your best interest at heart when actually it is finding reasons why you won’t succeed. It is trying to prevent you from taking risk (and we all know – or at least we should know – that you get ahead when you take some risk). It is what is stopping you from applying for that job until you meet 100% of the qualifications because you won’t get hired. It’s Often a Broken Record. The inner critic almost always has a core narrative that you have been hearing over and over – probably for many years. I am sure you can hear it in your head as I speak. It keeps coming at us, even when we know it isn’t rational, until we give the voice power. One of the big challenges of the inner critic, is that it might appear to have our best interests at heart. Back to applying for that job, on the surface it seems sort of logical not to apply for a job where you don’t meet all the qualifications, right? Inner Critic or Realistic Thinking? Well, hopefully by now, you are starting to see fault with that thinking. So how do you know if it’s your Inner Critic or just realistic thinking? In a nutshell, the inner critic makes assumptions, while realistic thinking asks questions. The inner critic responds in all or nothing or black and white scenarios while realistic thinking finds the grey and explores it more. The inner critic focuses on the problem while realistic thinking focuses on solutions. My inner critic motivates me. My inner critic makes sure I’m prepared. My inner critic prevents me from failing. And while these may be true, it is costing you. It is costing in terms of personal and professional growth, the quality of life and even your health. When you come up with a big idea? When you want to speak a differing opinion on a topic that matters to you? When you enter a room and don’t know anyone? I will admit, I am not one that normally buys into the woo-woo stuff and I never used to put much importance on journaling. It took me a long time to understand the importance of writing. Which seems funny as someone who writes and teaches about happiness. But naming my inner critic and becoming clear on its voice through journaling was extremely helpful to my inner dialogue. By the way, mine is named Mrs. Kravitz. I may be dating myself here but do you remember the nosy neighbor on Bewitched?That is so my inner critic. She butts her nose in where it doesn’t belong and questions everything that isn’t the way she thinks it should be. And it’s funny, when I started to put a face to my inner critic, I realized how pretentious and irrational it often is. So take the time to work through the exercise. You will be glad you did. It’s funny when I began to write this section, I immediately thought of my teenagers and immediately came to the conclusion that the inner critic (or at least mine) and my teenagers have a lot in common. The first thing you need to do is recognize when your inner critic is speaking and acknowledge it. So when I hear my inner critic speaking, I literally say to myself. “I hear you, Mrs. Kravitz.” It actually brings a smile to face when I do and I feel the pressure lift immediately. Once you recognize your inner critic and it’s voice, when it speaks to you try to understand its motives. What is it afraid? What is it trying to protect you from? Of course, finding holes in your inner critic’s reasoning is helpful but if those reasons are absurd or ridiculous even better. As I wind down on this very brief introduction to your inner critic, let me just say this. Just like any other work you do, whether it’s towards living a happier life, being more confident or eliminating negativity – your work on your inner critic is ongoing. There will be days when you think you have it under control and then there will be days when you just want to give up. It’s a struggle sometimes but just think of how many years of programming you are trying to reverse.